We are urgently looking for volunteers to join the River of Herbs orchards team – would you like to join us? Because our numbers have dropped recently due to changes in volunteer work days, we now have a tiny team and we need to expand! Could you spare a couple of hours a week to help with light gardening with this friendly group? The orchards house old fruit trees and were set up as ethical foraging gardens in 2014 by Lynn and a fabulous team of enthusiastic nature lovers. The four orchards are full of beautiful edible herbs, mushrooms, fruit trees and bushes and countless wildlife. We like to experiment with interesting plants, share food from our foraged harvest and generally have a good time together. Author LynnPosted on February 10, 2019 March 29, 2019 1 Comment on Join the team! The days are getting longer. Before we know it, the world will be covered in a verdant carpet, spring flowers and buzzing friends will be everywhere! It’s time to meet up and plan. To consider what we want to accomplish in the orchards and city this coming season. I’d love to see you there, if you want to get involved in any way with the River of Herbs project. Today we had mucky fun making seedbombs under the old cherry tree in the Park Frankendael orchards. We used our hands to mix gracefully aging seeds (collected, purchased and gifted over recent years) with terracotta clay powder, soil and just enough water. When the consistency felt right, we squeezed the mixture into small balls, just the right size to fit into egg cartons. When we ran out of egg cartons, we wrapped the rest of the seedbombs in newspaper strips. These beautiful balls of latent life and colour are now drying out on my roof terrace. Once they have dried sufficiently, we will store them in our homes and then carry a few around, ready to launch into needy spaces at opportune moments. The intention is to launch them all by the end of October, spreading thousands of herb and flower seeds around the city, in pleasing spheres of goodness. If you would like to make seeds bombs with us, feel free to come along to the orchards next Wednesday morning at about 11am. (Call me on 0627596930, if you want to join as the plan has changed, sorry for the late notice). If possible, bring along an empty egg carton and leave your best clothes at home. If you know somewhere that could use some seed bomb enrichment, do let us know in the comments below. We will try to walk by and launch some love and seeds onto the location. NL doet Compost heap building! I have organised another NL doet event this year, because the orchards needs a smart new compost heap and we need some help to make this happen. Would you like to help? River of Herbs orchards, behind Huise Frankendael, Park Frankendael. We don’t add any food waste to our compost heap, simply green waste from cutting back the perennial herbs which grow in the orchards. Most often, our green waste is laid as a mulch beneath the growing plants but sometimes there is just too much to handle so we need a place to keep it tidy. Over time, the collected green waste rots down and makes great quality organic compost which we then use to enrich areas of the orchards soil. Author LynnPosted on January 22, 2018 January 22, 2018 Leave a comment on NL doet Compost heap building! Whilst studying for her MSc in Spacial Planning at Wageningen University, Ioana-Cristina Musat became the first university intern at River of Herbs in Amsterdam. It was an absolute pleasure to work with Ioana and the Spacial planning department at Wageningen. As well as her full report, Ioana kindly created the following summary which outlines the main ideas and concepts resulting from her research. We hope that you find it inspiring and useful – we certainly have! 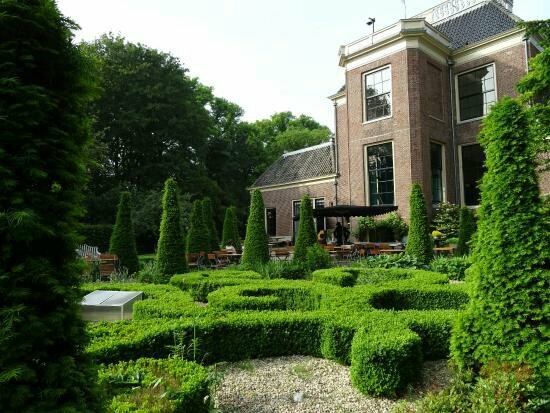 ​3pm til 5 pm this Sunday (25th November) – Celebrating the old Stijl Tuin behind Huize Frankendael. So Lynn forgot to pay the hosting bill for the old website.. A mixed blessing as we now have a sparkly free wordpress.com site but all the old content is lost. Apologies – she plans to shift the old content here very soon. River of Herbs Blog at WordPress.com.